Best DVD Ripper Platinum, and convert different video with multiple formats. 3herosoft DVD Ripper Platinum Suite is the best and special DVD Ripper and Video Converter software pack which includes two powerful tools, 3herosoft DVD Ripper Platinum and 3herosoft Video Converter. 3herosoft DVD Ripper Platinum Suite can rip DVD and convert various video formats to video and audio formats for Apple iPod, iPhone, Apple TV, Xbox 360, Zune, PSP, Pocket PC, Creative Zen, and Archos and so on. 3herosoft DVD Ripper Platinum can perfectly rip DVD movies with no loss of image and sound quality. 3herosoft DVD Ripper Platinum supports almost all popular portable devices such as iPod, Zune, iPhone, Apple TV, PSP, Xbox 360, PS3, MP4/MP3 Player, Smart Phone, Pocket PC, PDA, Mobile Phone, Archos, Archos AV500, Archos AV700, Archos GMini402, iRiver PMP-100, Creative Zen Vision, etc. 3herosoft Video Converter supports so all-around video formats such as WMV, AVI, DivX, MPEG, MP4, H.264/MPEG-4 AVC, RM, MOV, XviD, FLV, 3GP, VOB (the video format used in DVD), DAT (the video format used in VCD, SVCD), and so on. It can also extract audio from video file and convert them to M4A, MP3, AC3, AAC, WMA, WAV, OGG as you want. Free get 3herosoft DVD Ripper Platinum Suite now and be your DVD and video master! 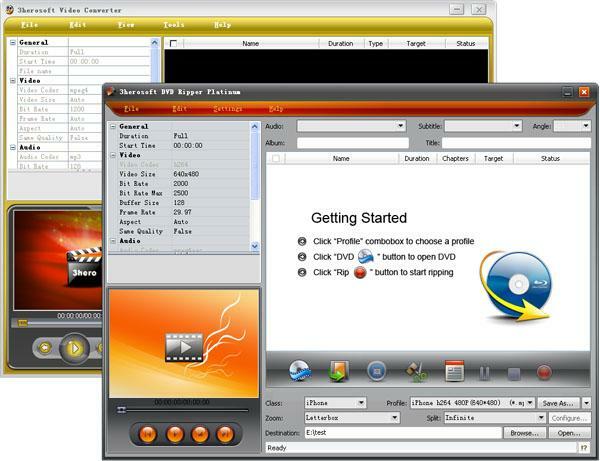 It includes 3herosoft DVD Ripper Platinum, 3herosoft Video Converter. Rip DVD movie to AVI, MPEG-4, WMV, DivX, MP4, H.264/AVC, RM, MOV, M4V, XviD, 3GP, VOB, FLV, and SWF. Extract audio from DVD to MP3, WMA, WAV, RA, M4A, AAC, AC3, and OGG. Convert most HD videos like H.264/MPEG-4 AVC, Apple TV H.264 720P, HD WMV to HD videos. Freely convert amongst all popular video formats, such as MPEG, MPEG 2, VOB, DAT, MP4, RM, RMVB, WMV, ASF, AVI, 3GP, FLV, SWF, MOV. Extract audio file from video file and convert them to MP3, MP2, AAC, AC3, WAV, WMA, M4A, RM, RAM, OGG for your listening anywhere and anytime. The output files can be played well on almost all smart devices, such as iPod touch, iPod Nano, iPod Classic, iPhone, Apple TV, PSP, Zune, Creative Zen Vision, Archos, iRiver, HP iPAQ, General Pocket PC, BlackBerry, Xbox360, PS3, YouTube, Mobile Phone, and other multimedia devices. Multithreading and batch conversion provide super fast conversion speed due to multi-core CPU support. Faster than any other video converter and DVD Ripper software.